"Thank you for the wonderful ceremony....your sermon was perfect and fit perfectly. Many guests at the wedding came up to me to tell me how much they enjoyed the ceremony and meeting and talking with you. I am so happy Lisa introduced us. May God continue to bless you and your work." "We would like to thank you for celebrating our wedding ceremony... We have enjoyed meeting and planning our ceremony with you! "We thank you so much for being a part of our special day!! Everyone was talking about what a great ceremony it was!!!" 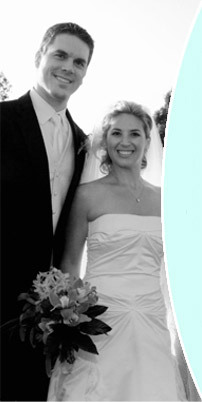 "Thank you so much for being a part of our wedding day and for all of the preparation work you did with us beforehand! We truly felt like our wedding ceremony was personalized to us and reflected everything we wanted and discussed with you ahead of time. We hope to stay in touch over the years." "Thank you so much for being a part of our special day. It has been such a pleasure working with you. You have such a great gift and talent which has contributed to this great experience." "The ceremony was beautiful. Everybody loved it. Thanks for everything." "It was a pleasure meeting and working with you. The ceremony went quick and without a hitch; the wedding day was perfect." "It was such a pleasure working with you and getting to know you. We really enjoyed the whole process. Thank you for giving us such a memorable ceremony. We appreciate your spiritual guidance throughout the process." "Thank you so much for your part in our glorious day. I am so thankful for the wisdom you imparted and for bringing God into the wedding... keep up the good work and I hope you continue to share yourself with many other couples"
"On behalf of my husband and I, we would like to thank you from the bottom of our hearts for giving us a beautiful ceremony... thanks for everything." "Not only did you make our special day unique from any others but you also made it special for all of our guests. We received many compliments on your sense of humor. Your service was excellent and you made a great impact on the whole ceremony. You made our day very special, loving and personal. Thank you." "The ceremony was lovely. We had a wonderful day and thank you so much for being a part of it. Everyone loved you!" "Wow, where to start. We just wanted to say thank you so much for our wedding ceremony; it was truly an awesome day. We would not have changed a single thing about it. We had so much fun leading up to it and getting to know you. We hope only the best for you and hope somehow we can keep in touch. Every 4th of September we will remember you. Thanks again." "Thank you so much for performing our wedding ceremony! It was perfect---just lovely! I've heard from many people that they loved the way you did everything. We are quite fortunate. Also, thank you for helping with the certificate and county process. Your office staff are so helpful." "The wedding was perfect. I don't think the ceremony would have been the same without your truly unique gift and words. Thank you so very much for everything." "Thank you for being our priest on our special day. We were well prepared because of your kind words and advice. We appreciate you explaining certain traditions to our guests. You made everyone feel welcome." "We would like to thank you from the bottom of our hearts for all of your guidance, support and friendship. The ceremony was beautiful, spiritual, charismatic and heart warming. "Marlena and I cannot thank you enough...you were the PERFECT choice for our wedding....we received many compliments on you from people who not only felt you were nice and appropriate but also for the meaningful words you spoke during the ceremony."